Wedding cakes can be quite expensive, quite often couples find no one really eats them and then there’s the left over’s that you can’t bring yourself to throw away but no guests want to take home either! They can be a tricky business at times! Some people just don’t see the appeal in them, for this reason we have compiled alternative wedding cake ideas and options. There’s plenty of options for couples not into the traditional cake thing and want to change it up a bit. Here’s some wedding cake ideas and alternatives on for special day. Love this idea, if sweet treats aren’t really your thing, but you still want to stack something for your wedding, some couples have given the perfect wedding cake substitution. Tiers of cheese instead of tiers of cake! Brilliant, less expensive (unless you really like expensive cheese), and can be washed down perfectly with some wine and fruit. They can also be decorated quite convincingly. These little rings of deliciousness are quickly taking the handheld dessert market by storm. Back in the day a doughnut was either filled with jam, glazed, or powdered. But now the gourmet doughnut options are endless, and can be dressed up or down to suit your type of wedding style. This is for those that are still into cake, but would like an easier way to distribute dessert to the guests. Cupcakes are easy, single portioned little desserts that really everyone loves. 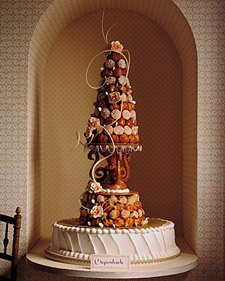 Another one thats easy to split evenly and quickly to guests is the Profiterole Pyramid or Croquembouche Tower. Usually filled with cream or dulche de leche these beautiful creations are favoured by nearly everyone. Can be make to look fancy or dressed down for a more rustic affair. This is more of an American tradition, but it is quickly taking Australian weddings by storm as well. The cake or pie pop can be decorated quite elegantly, and arranged in a way that mimics a cake, with less mess, you won’t even have to dirty a plate. No fuss alternative to cake, often lasts longer than cake does (although does lose its texture after a day or two) and you can have in multiple flavours that will please everyone. This is less common, although has been done a few times, looks amazing and is sure to disappear quickly. Less mess, less fuss and less cost, there’s always a good reason to eat Oreos. Though, definitely keep in mind bits of chocolate biscuit getting stuck in your teeth though, not a good look for the bride and groom! Why not give your guests (and yourself) a little variety. If you have a large cake those people that don’t like cake will steer clear, but if there’s a whole table of options on the final meal of the night, you are sure to please every one of your guests (except for the ones that don’t like dessert at all, but who needs them anyway). Warning: sugar overload for the dessert lovers that will try to eat a bit of everything. You can still have an elegant cake in a small shot glass form. This works well for cheesecakes, trifles and layer cakes that can be messy when in a large cake form. Plus, when it comes to the decision between cheesecake and a normal cake, cheesecake has to win every time! Brownie’s aren’t just for break ups and little children, these delicious fudgy beauties can be stacked together to look like a wedding cake. Who doesn’t get excited when they see brownies? You’ll be spoiling your wedding guests with treats from their childhoods. So what do you think? Have you discovered wedding cake ideas from these?